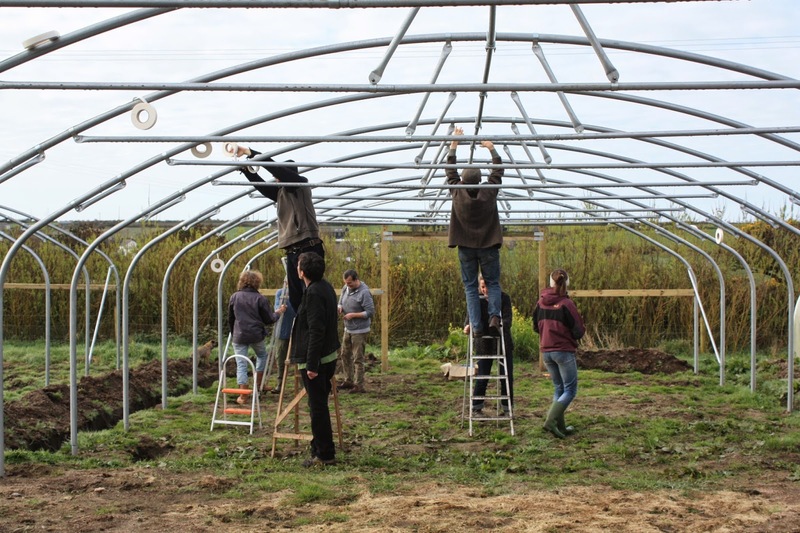 First of all we'd like to thank Claire from The Conservation Volunteers and her Green Gym for spending a day digging over the inside of the new polytunnel, and taking out the dock, burdock, dandelion and couch grass roots. 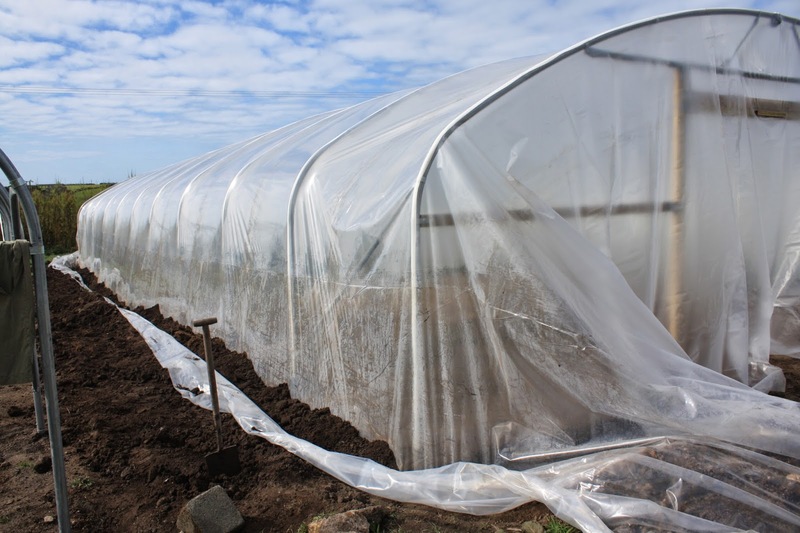 The tunnel is now fully sown and planted, with soaker-hose irrigation throughout. 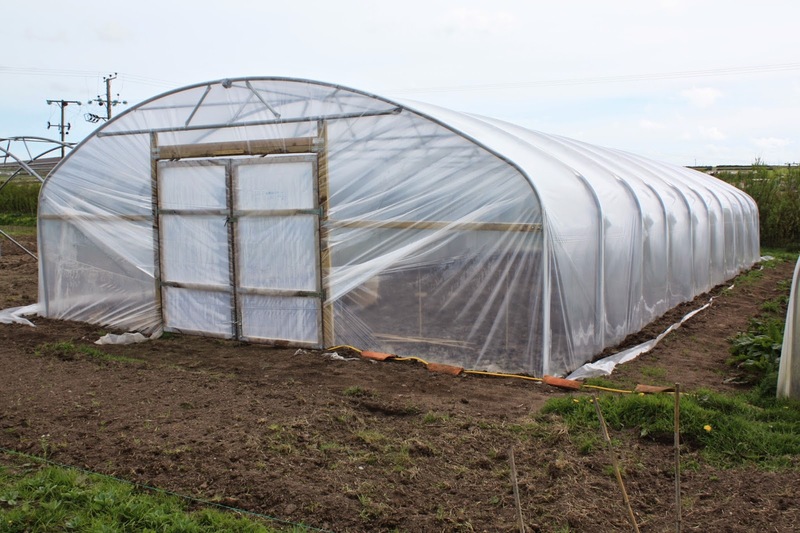 Our fourth polytunnel completed and ready for planting. 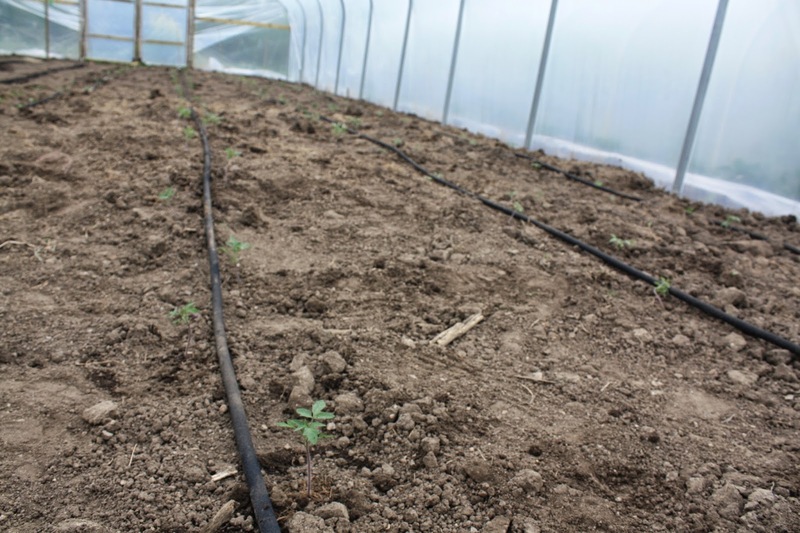 In the past week we have sown 2 lines of spinach, one of radishes, erected 2-metre-high netting and sown a line of climbing French beans, transplanted a line of May Queen lettuces, and today we planted 170 tomato seedlings in the remaining 4 lines of irrigation. 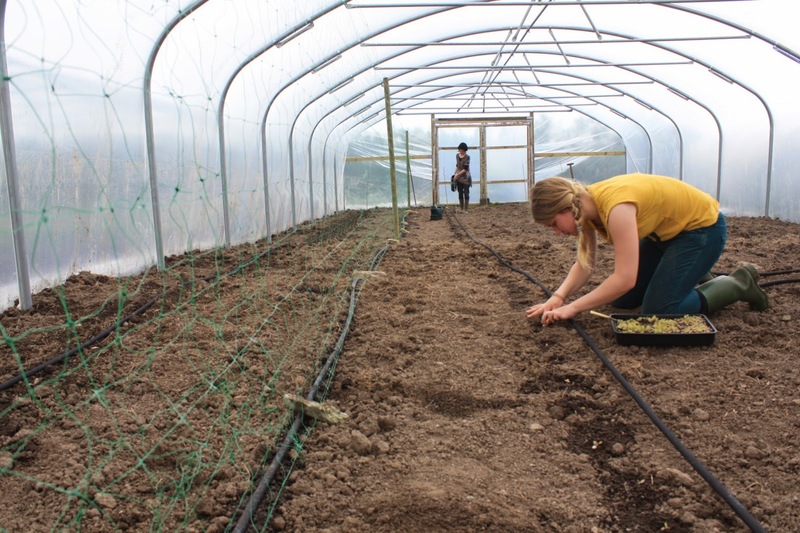 Alice and Viktoria planting lettuce seedlings. 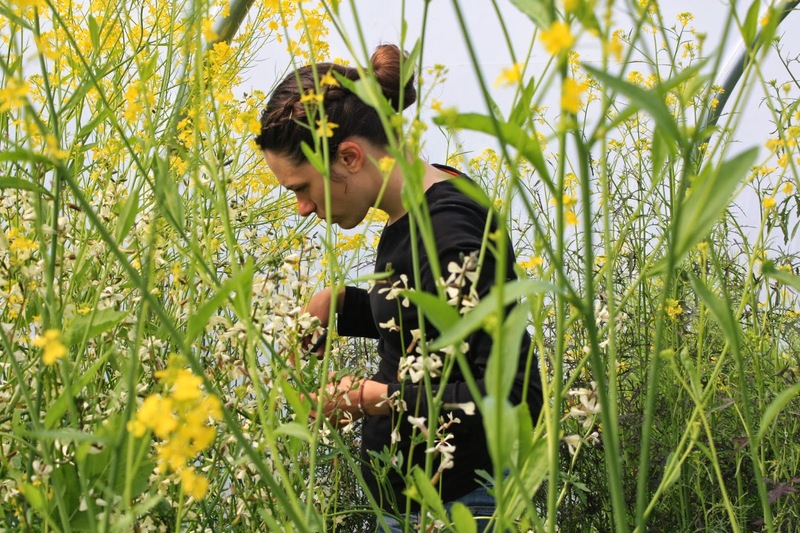 The farm would like to give an enormous thank you to Lina, from Munich, for her two months invaluable volunteering on the farm - we wish you all the best for your remaining studies. 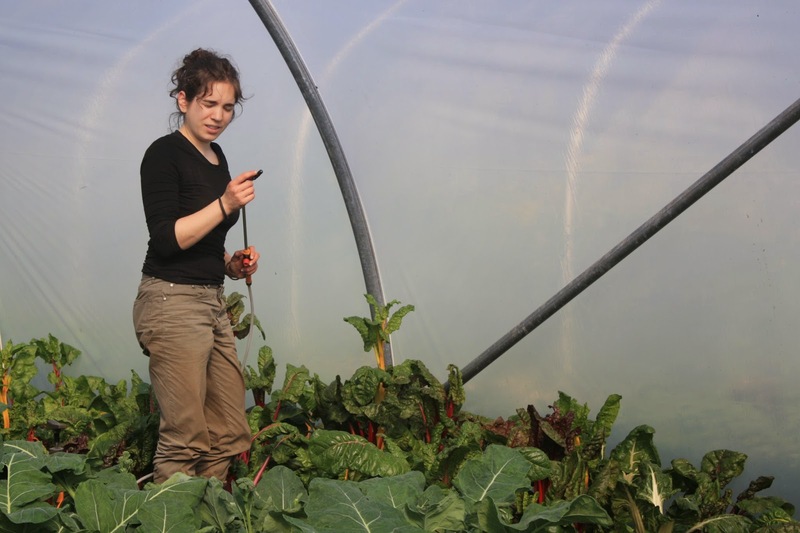 Lina picking salad in the jungles of our polytunnel. Also many thanks to Mackie, who came down from Bristol for two weeks volunteering - special thanks for all the rye bread and flapjacks! 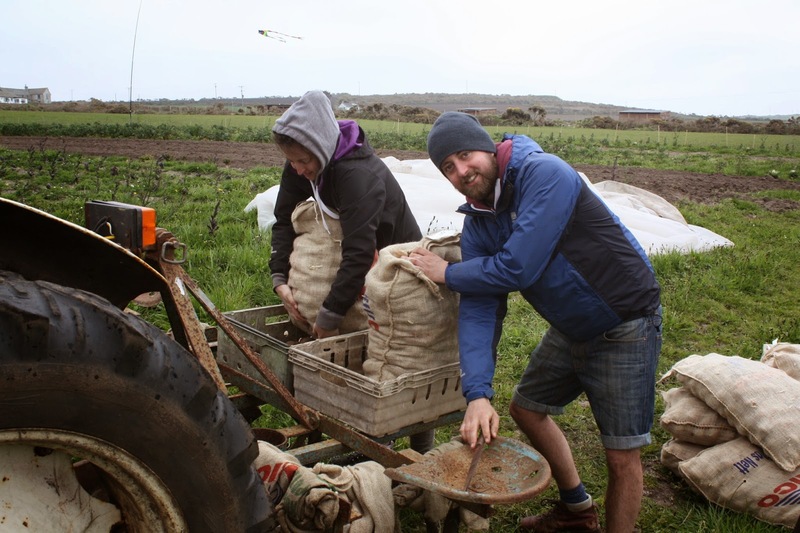 Alex and Tessa escaped London to spend Easter week volunteering on the farm - many thanks to them for their help, in particular getting all those spuds in the ground! Tessa and Alex loading the potato planter. Last week, quite a bit later than intended, we planted 2 acres of potatoes on the farm. In one field we have an acre of earlies (Rocket and Maris Peer) plus experimentals (Blue Danube, Sarpo Axona, and Valor), and in another field an acre of Picasso maincrop (Ambo stocks had run out and this is the closest alternative). 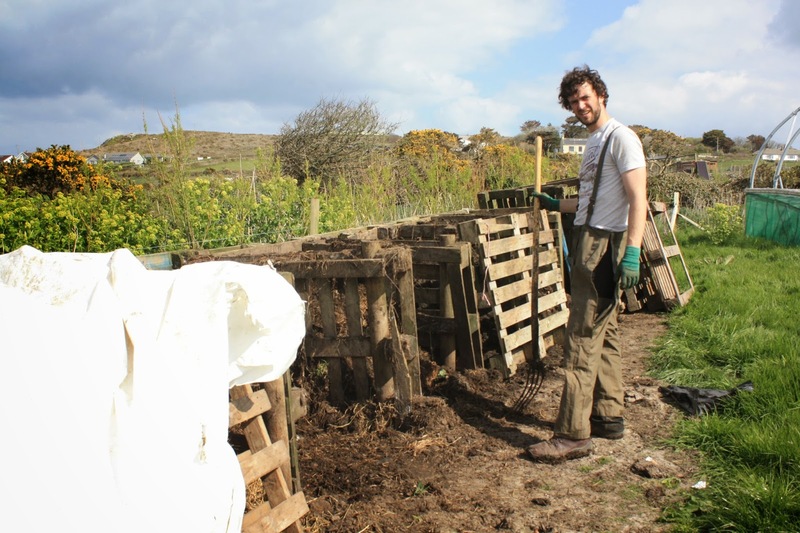 Many thanks to our wwoofers Tessa, Alex, Lina and Mackie for taking it in turns to sit on the back of the planter in some very strong winds. 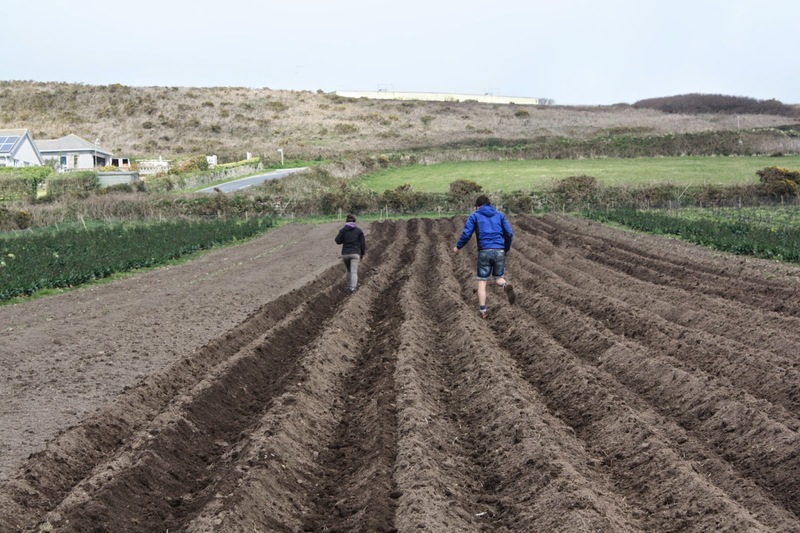 Tessa and Alex checking newly planted potato ridges to cover up any stragglers. 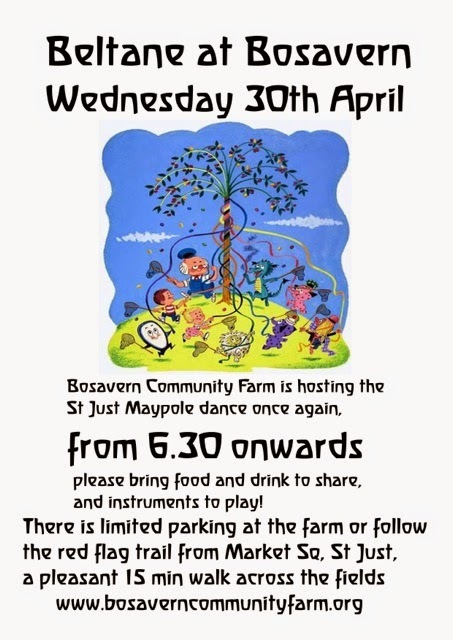 Next community event - Beltane. 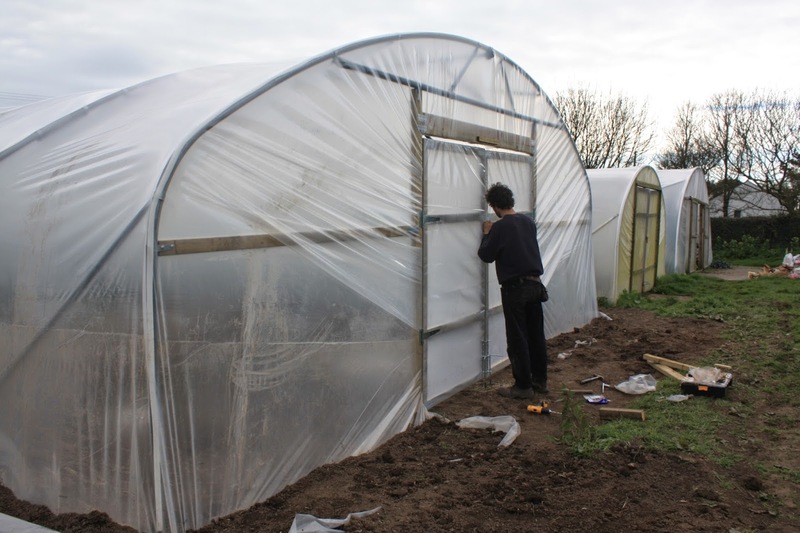 On Thursday 10th April we bit the bullet and skinned our fourth polytunnel - thankfully the weather behaved and even the wind kept low all day so we had almost perfect conditions. This is a 60 by 24 foot tunnel, erected without the use of concrete, all held down by earth and metal anchor-plates. Applying anti-hotspot tape to the frame before the skin goes on. Morning coffee break - well deserved with the skin already over the top. Beginning to fill the trenches to hold the plastic in place. Working on the end of the tunnel. Fitting the final door in the early evening. 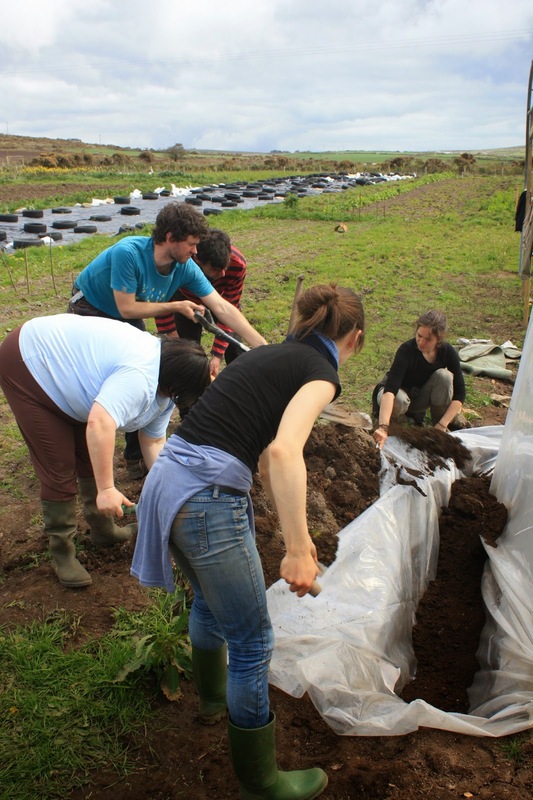 This year we will grow French beans, aubergines and herbs in the tunnel - but first we need to prepare the ground.... Many thanks to our wonderful volunteers on the day - Kate G, Kate B, Pete, Paul, Andrew, Leire, Lina, Anne, Jim and Mackie. Within a month we'll be doing the next one! We'd like to thank Leire, from Asturias in northern Spain, for her invaluable contribution to the farm for one month, and wish her all the best amongst the Dartmoor blueberries. Leire treating our chard with a homemade nettle concoction to counter blackfly. 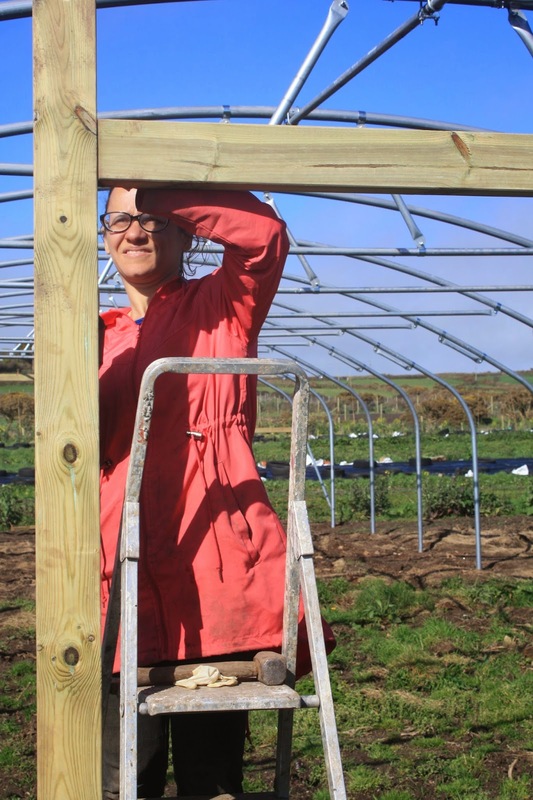 Flavia helping to construct our fifth polytunnel. Many thanks to Flavia, from Brazil, for helping on the farm for 2 weeks - we hope you enjoy the rest of your time in the UK. Many many thanks to Claire from Canada, who left for her next wwoof farm this morning having volunteered with us for 5 weeks, and made a valuable contribution to the running of the farm throughout her stay. 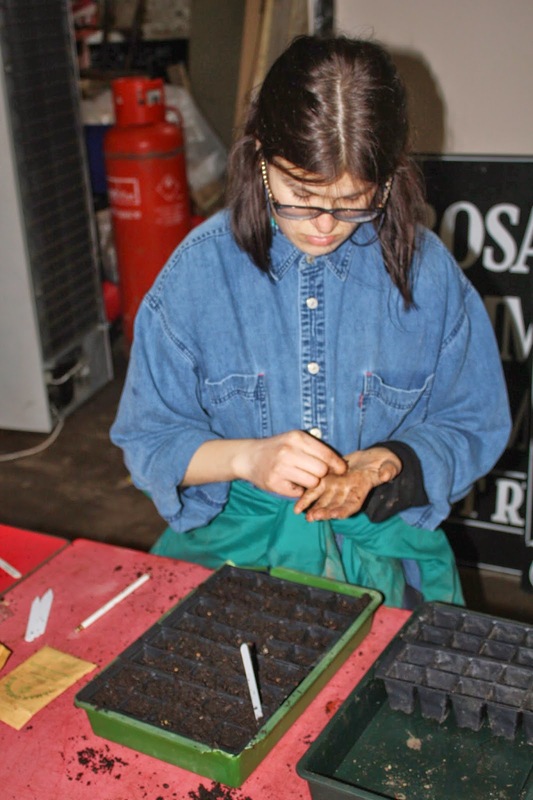 Claire sowing seed modules in the packing shed. 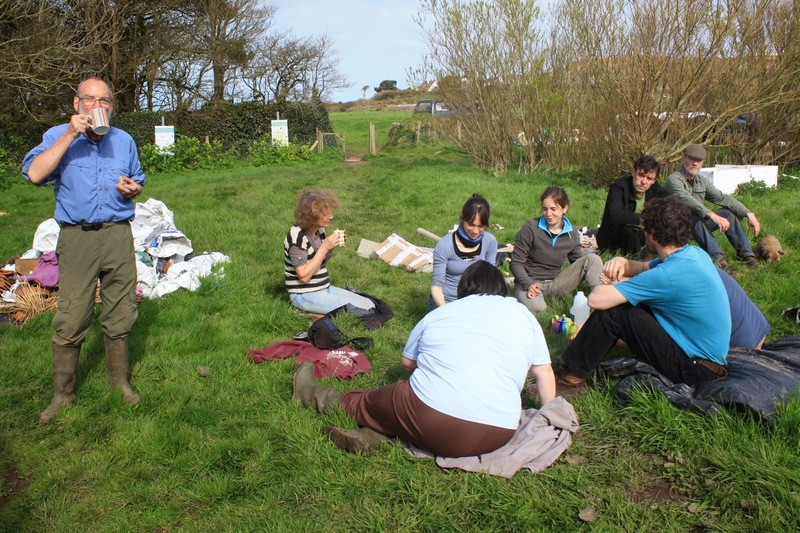 Fantastic news - after a far more lengthy process than we expected or hoped, Bosavern Community Farm has been purchased by Bosavern Community Enterprises (a not-for-profit social enterprise) from Cornwall Council. 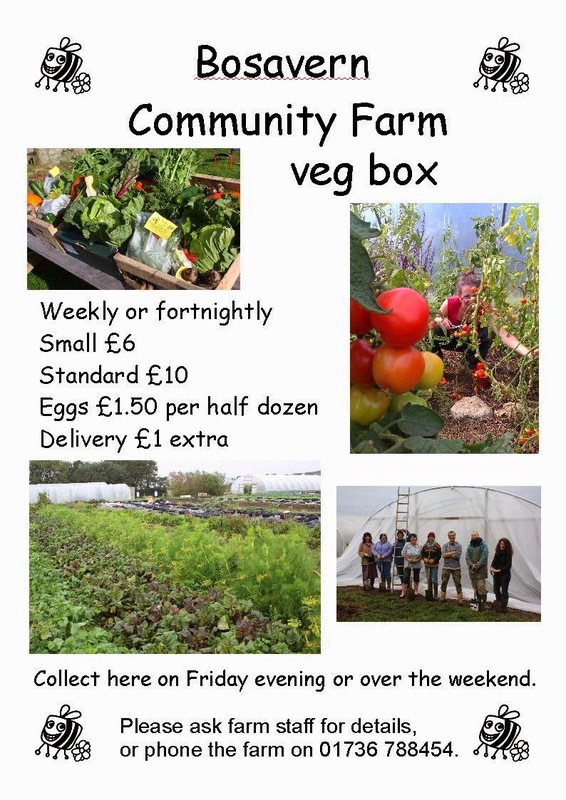 The community farm is now entering another exciting and positive stage in its development, so please wish us luck, come along and help at one of our volunteering sessions, do your shopping at the gate stall and in the farm shop, and support us in whatever way you can! We are sorry that the March Merriment event had to be postponed at the last minute - our field where the parking was to be was waterlogged in yet more torrential rain, and even our tractor got stuck there. Our next event will be Beltane on the last evening of April, and March Merriment will morph into May Madness (or similar) on the fifth Saturday in May (31st) so please come along then, and watch this blog for details.